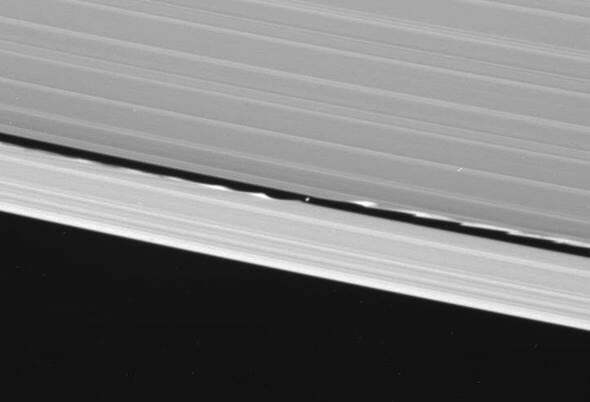 Daphnis makes waves in Saturn’s rings. The wee moon Daphnis carves gorgeous patterns in Saturn’s rings. When I saw the image above, I literally gasped. It’s an amazing photo, showing the small moon Daphnis inside a gap in Saturn’s rings. The beauty of this shot is apparent, but the science behind it is even cooler. On Nov. 30, the Cassini spacecraft orbiting Saturn took on a new and risky mission. It began a series of orbits that are taking it over the planet’s north pole and then down just outside the main rings. In mid-January it dipped through the ring plane on one of these orbits, passing a mere 28,000 kilometers from the tiny moon Daphnis when it took that shot with its narrow-angle (i.e. high-magnification) camera. That’s the highest-resolution image of Daphnis ever taken; for scale, the flying-saucer-shaped moon is about 8 x 8 x 6 km in size. Measured from sea level, Mount Everest is roughly the same size. You can see some structure to Daphnis; there’s a ridge around its equator that’s probably due to ring particles that have piled up there, and a second ridge at higher latitude. The soft appearance to the moon is probably due to the accumulation of small grains of ice from the rings that have coated it, filling in the craters and other features. That gap in the rings is real. It’s called the Keeler Gap, and it’s about 30–40 km wide. The width of the gap appears foreshortened because Cassini was just above the ring plane when it took the shot; it’s actually several times wider than the moon is long. But, oh, those ripples! That, my friends, is the result of gravity. It’s a complicated and intricate dance between moon and rings, but it’s worth learning the moves. Saturn’s rings are composed of countless tiny particles of ice, each in its own separate orbit around Saturn. They’re tremendously wide—the main rings are 300,000 km across, and would stretch 3/4 of the way from the Earth to our own Moon—but are astonishingly flat. In some places they are only 10 meters high from top to bottom, the height of a three-story house. To scale, this makes them far thinner than a piece of paper. Cassini took this wide-angle shot around the same time as the narrow angle one. Note how far the waves go around the rings. Saturn is to the upper right. This is a raw image, so there are some blemishes that aren’t real objects. There are several subdivisions of rings, given letter designations in order of discovery. 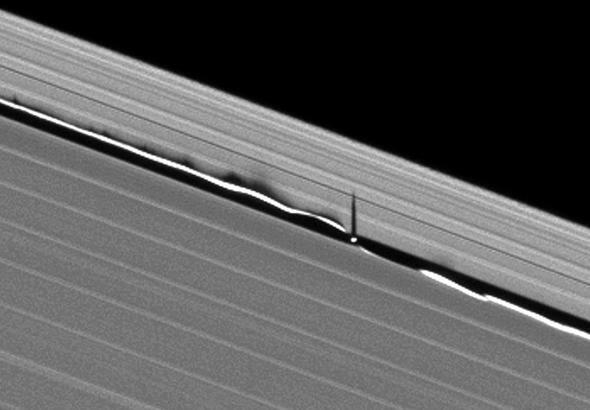 The broad A ring has distinct two gaps in it, carved by moons orbiting Saturn embedded in the ring. The Encke gap is 325 km wide, and is from the moon Pan. The much narrower Keeler Gap is due to Daphnis. If you plunk a small moon down in a ring, it will of course carve a gap as it plows through material. Its gravity will attract more material as well, so particles just inside and outside the moon will, over time, fall onto it. The gap grows, but the width of the gap depends on the strength of the moon’s gravity. At some distance, the gravity is too feeble to pull particles all the way out of the ring and onto the moon. Pan has nearly 100 times the mass of Daphnis, so its gravity is stronger, and the gap it carves wider. What causes those ripples? The orbit of Daphnis is not a perfect circle, but instead is very slightly elliptical. That means it’s sometimes closer to the inner edge of the Keeler gap, and sometimes closer to the outer one. The change is small, only about nine km, but that’s enough. When it’s closer to one edge it pulls on the ring particles a bit harder, creating the wave. But there’s more to it. The orbit of Daphnis is also tipped a bit to the ring plane, a mere 0.0036° from being exactly aligned. That means it bobs up and down out of the ring plane by about 17 km. When it does it drags the ring particles at the gap edges as well. Those waves you see in the image go in and out of the gap, but also up and down by a kilometer or so. Perspective makes that hard to see here, but twice every time Saturn orbits the Sun, the rings are edge-on to the Sun, and any vertical excursion can cast long shadows. In 2009, the Sun shone straight along the rings, so any features out of the ring plane cast long shadows. That image was taken at Saturn’s northern hemisphere spring equinox in 2009. It’s incredible! 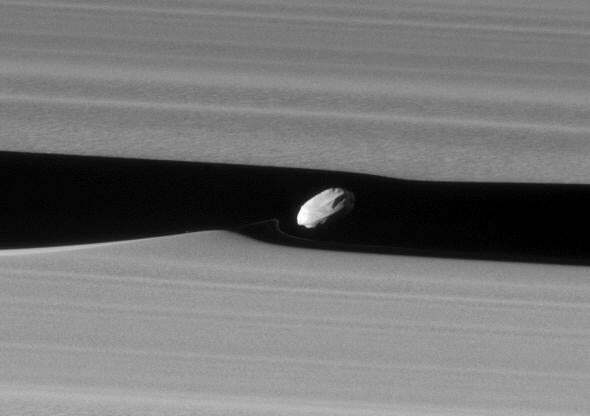 You can see Daphnis and the long shadow it casts on the ring. You can also see the vertical waves caused by the moon’s feeble pull. Each wave corresponds to one up-and-down bob of the moon relative to the rings. Eventually, tides from Saturn pull the particles back down, but that takes a while, and the ripples extend for a long way around the ring. How about that? But wait! There’s more! Look again at the first picture. You can see the ripple to the left of Daphnis is fuzzier than the others. That may be due to very tiny grains being pulled out (that ripple is on the outside of Daphnis, so was created the last time Daphnis passed those particles). The particles are brighter there than on the ripple right next to Daphnis, which is interesting; that may be due to the Sun’s illumination on the wave. That’s a closer look at the top photo. 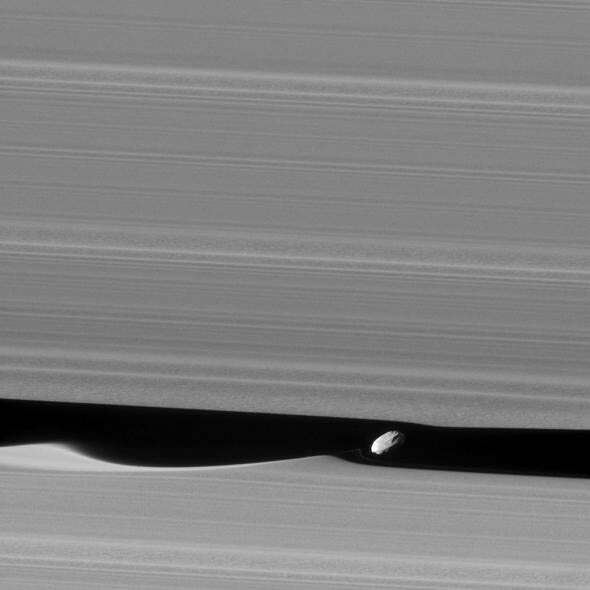 You can see a very thin ribbon of material to the left of Daphnis. That may be due to a clump of material in the ring that was pulled apart by the moon! Note the shape, too; it mimics the ripple but looks like it goes deeper into the gap. Amazing. When I saw that I had to sit back and stare in awe. I don’t think anything like that has ever been seen before. Also in that shot you can see the rings look grainy. That may very well be a hint of the actual grainy particulate nature of the rings, where material has clumped up! Cassini is getting closer to the rings than it ever has before, so we see them in more resolution. I hope we get even better shots of them over the next few months. We’d better, because time is running out. Cassini’s end-of-mission is in September of this year, and when it’s done engineers will command it to plunge into Saturn’s atmosphere, where it will burn up and be crushed. This is done to prevent any possible contamination of the moons in case Cassini might impact them in the future after fuel has run out. Instead, the remaining wisps of fuel will be used to send the probe into the planet itself. I’ll hate to see Cassini go. But images like the ones of Daphnis make me glad we had Cassini for as long as we did. It’s a truly historic mission, and its legacy will live on for a long, long time. Tip o’ the RTG to Ian Regan.